Shiitake? Portobello? Magic? Which will turn me into the healthiest mushroom man ever… and possibly also help me reach another dimension? Mushrooms are weird as hell. Some grow in caves, some can kill you and others can make you enter a time warp that bends reality and helps you make friends with talking bear-men (s’up, Grar-R’owth, be seeing you later). 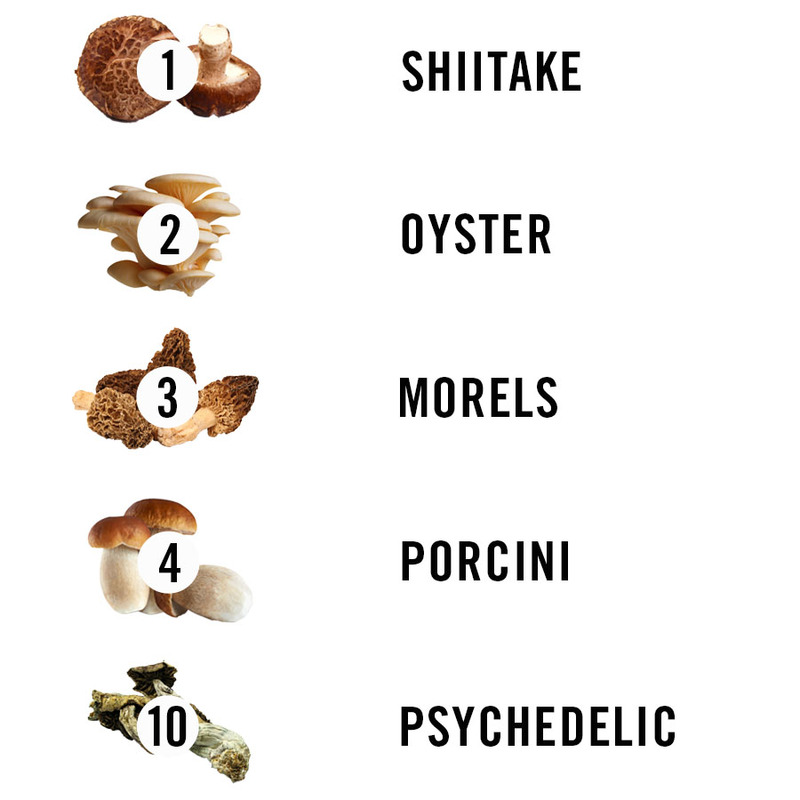 Overall, edible mushrooms are super freaking healthy, but being the nitpicky types we are, I asked nutritionist David Friedman, author of Food Sanity: How to Eat in a World of Fads and Fiction, to help me rank some of the most common types — from superfood to… well, you’ll just have to keep on reading. Got high cholesterol? Shiitake are good for that, too. “They have potent cholesterol-lowering effects thanks to two compounds called chitin and eritadenine, which have been shown to inhibit an enzyme involved in producing cholesterol,” Friedman explains. “Additionally, they contain a fiber called beta-glucans, which has also been shown to lower cholesterol.” Friedman adds that shiitake mushrooms have antiviral capabilities, antibacterial functions and antifungal properties. They also help stabilize blood sugar, and may reduce atherosclerosis — that is, plaque buildup in the arteries. 7) Portobello: Similar to many other varieties on this list, portobello mushrooms are high in niacin, potassium, copper and selenium. However, they contain a relatively low dose of vitamin D. “What they lack in vitamin D, they make up for in riboflavin, an important nutrient for energy production, since it helps the body break down carbohydrates into sugar for fuel,” Friedman explains. “Portobellos also contain conjugated linoleic acid (CLA),” Friedman continues. “CLA blocks aromatase, a protein necessary for producing estrogen in women. Since about 70 percent of breast cancers are hormone-dependent, the ability to block aromatase can help reduce and even stop breast cancer.” Additionally, Friedman mentions that portobello mushrooms are a good source of L-ergothioneine, which can help ward off chronic inflammatory diseases, like Parkinson’s. As if that weren’t good enough, enoki mushrooms also protect our bodies from all kinds of ailments. “Extracts from enoki mushrooms contain ribosome inactivating protein (RIP), which exhibits diverse bioactivities, including anti-tumor, immune-modulatory and anti-human immunodeficiency (aka, anti-HIV) virus actions,” Friedman says. “RIP extracts from this mushroom have also been demonstrated to possess anti-neurodegenerative effects (so they protect nerves and the brain).” So in many ways, it’s the opposite of the more traditional RIP. 9) Cremini: “Cremini mushrooms are a great source of many vitamins and trace minerals, including vitamin B2, vitamin B3 and vitamin B5, which is needed to fuel the brain, aid in cognitive health and help prevent fatigue,” Friedman explains. “Research from Penn State shows that crimini mushrooms rank right up there with carrots, green beans, red peppers and broccoli as good sources of dietary antioxidants.” Additionally, much like portobellos, cremini mushrooms contain conjugated linoleic acid, which may help protect against prostate cancer and leukemic monocyte lymphoma. Nutritionally speaking, magic mushrooms are similar to many other mushrooms on this list. They contain an array of B vitamins, vitamin D and vitamin K (which helps with blood clotting). They also boast several minerals, including iron and copper, and contain virtually no calories at all. That said, I definitely wouldn’t recommend eating them in the same amounts you might eat regular, non-psychedelic mushrooms, for reasons I don’t think I need to explain (right, Grar-R’owth? ).